So many ways to traverse Maryland’s waterways, so little time. Maryland's waterways are a defining feature of the Old Line State, and no visit is complete without leaving the land behind, even for just a little while. Here are ten great ways to see the Chesapeake Bay and other Maryland waterways. Adventure Sports Center International is THE place to test your timing, reflexes and teamwork on the world’s only adjustable whitewater sports venue that offers class I - IV whitewater in a “controlled” environment. The 1/3 mile artificial river features authentic whitewater rapids, and is the most natural looking and feeling course of its kind in the world. National Harbor offers a number of options for getting out on the water from the shores of the Potomac River, including sunset kayak tours and introductory stand-up paddleboard (SUP) classes offered by Boating in DC Or, just rent a kayak, canoe or SUP and explore on your own. View many more SUP opportunities around Maryland . The Skipjacks—queens of the Chesapeake oyster fleet and official Maryland state boat—are the last commercial sail fleet in the country, and there aren't many of them left. The H.M. Krentz, built in 1955, is based at the Chesapeake Bay Maritime Museum in St. Michaels, which is worth the trip in itself. Sailing charters on the H.M. Krentz depart daily from April to October—great months for enjoying Maryland’s waters. If you're visiting Baltimore’s Inner Harbor, take in the city’s skyline from a watery vantage point. 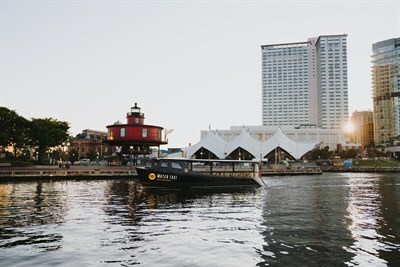 A one-day pass for a water taxi gets you unlimited travel among 17 stops from the Inner Harbor to Fells Point to Ft. McHenry, so you have plenty of chances to hit all the harbor highlights right from the water. The Atlantic coast has ample opportunities for ocean game fishing, and the Chesapeake Bay is the perfect place for sport fishing, as well. Rockfish is the Maryland State Fish and a local favorite (known elsewhere as striped bass), but you'll also be able to catch Bluefish, Croaker, Trout, and a host of other species. Whatever you're after, Charter companies like the Upper Bay Charter Captains Association and the services at the Chesapeake Beach Resort & Spa can “hook” you up! If manning the wheel (or the tiller) isn't your thing, charter cruise companies like Watermark Cruises offers comfortable rides out of Annapolis and Baltimore ranging from 40-minute sightseeing tours to all-day excursions. While you float along, the narrated cruises impart interesting information about the city you’re visiting and its waterfront history. Settle back and enjoy the ride. More about Watermark Tours. Charters. Cruises. If you're lucky enough to have your own trailerable boat, there are dozens of public boat ramps waiting to serve you. Whether you’re in Ocean City (87th Street) or the Baltimore Harbor (Canton Waterfront), you can find a place to splash down, often for free. The Department of Natural Resources maintains a map of access points across the state, so begin your search there since hours and fees can vary. Make a statement when you cruise down the beautiful Chester River aboard a classic 1920’s-style yacht. The Chester River Packet Co. offers both charter cruises and public sails, leaving from High Street in downtown Chestertown. There are all shapes and sizes of boats available for rent around the Bay. Crisfield is a good place to check out (bonus: it is the "Seafood Capital of the World"), and Crisfield Kayak & Canoe offers a variety of kayaks and canoes that can be delivered to any destination in the Somerset, Worcester and Wicomico area. But wherever you are on the Bay, someone will be happy to rent you a boat for an hour, a day, or longer—see all the boat rental options to choose from. If lake boating is your thing, check out Deep Creek Lake, Maryland's largest inland body of water, covering 3,900 acres. 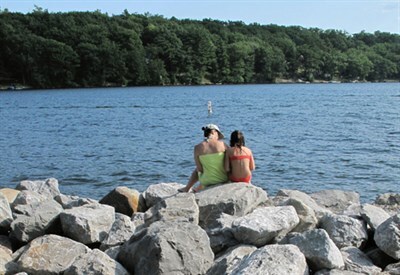 Fishing, canoeing, swimming and waterskiing are popular at the lake, which is surrounded by a state park. Public boat ramps are available, or if you don't have your own boat, you can rent one nearby. For novice boaters, a pontoon boat makes for low-key boating fun. Jet skis are the motorcycles of the boating world, so what better place to show off your skills (or learn some new ones) than the beaches of Ocean City? Coastal Highway is lined up and down with Jet Ski rental shops (as well as rentals for surfboards, kayaks, and paddle boards). Do a couple of quick beach runs and be back in time for steamed crabs! Stand up paddleboard, referred to as SUP, is becoming one of the fastest-growing watersports and is a new way to have fun on many of Maryland's waterways. Take a boating or sailing trip in Maryland - browse some of the best businesses here that will help you get out on the water. With rivers, lakes, beaches and the Bay, Maryland has an incredible variety of places to enjoy water sports.